Tues, July 10 8:00 a.m. to 6:00 p.m. Seniors on the Move will travel to Reiman Gardens in Ames on Tuesday, July 10th for a morning tour. There are 17 acres of beautiful indoor and outdoor gardens, including a 2,500 sq. ft. Butterfly Wing. The next stop on this Groovy Flower Power Tour will be at the Wild Rose Casino in Jefferson, where we will have lunch as well as some fun (and luck!) for those who chooses to partake in the entertainment. One final stop will be at the Thomas Jefferson Gardens of Greene County before heading back to the Metro area. We will tour both the gardens and the Bell Tower. 8:20 a.m. Pick up at Bonanza, 5029 NE 14th St., Des Moines. 9:15 a.m. 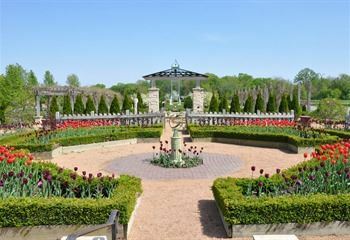 Arrive at Reiman Gardens and tour gardens. 11:00 a.m. Depart for Wild Rose Casino for lunch and some fun at the Casino. 3:15 p.m. Depart for Thomas Jefferson Gardens of Greene County. 5:30 p.m. Estimated time of arrival back at Walmart, Windsor Heights. 6:00 p.m. Estimated time of arrival back at Bonanza, Des Moines.